prosper. Our lockers and storage units are designed to address these issues. Companies facing eroding profits no longer target their old objectives, but look for new and more efficient economic ways to exist in today's aggressive business pace. While manufacturers continue to rise in other countries, the United States continues to lead the way in production and conforms to the stringent standards of doing business making it more affordable for commerce. In the midst of uncertainty and with the cost of operations attached to stringent regulations, cutting out the middleman distributor and relying on knowledgeable programming procedures, the pressure from all sides subsides and offers balance within the ever changing world. As a full service wholesaler, XPB Lockers offers an optimized selection of industrial and commercial lockers and storage units, from executive wood locker furniture to bright colored plastic security outdoor lockers including a vast range of retrofit building signage, used lockers, commercial shower and a complete range of commercial bathroom equipment, ADA compliant and offered to work with many budget plans. Our increased efficiency in production offers peace of mind with the broad spectrum lockers and storage units constructed of heavy duty metal and plastic materials designed to withstand industrial and commercial standards and save owners, operators and management time and money ensuing solid and effective storage results. Investing in quality equipment designed to resist time, like our lockers and storage units, these tangible resources will begin to reduce overhead and operations expenses, and further provide for a more efficient level of organization and adjacencies planning circumventing future costly expansion. 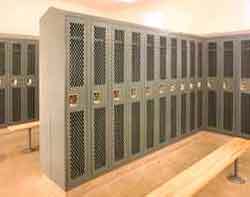 From rural America to the international and corporate giants our company has supplied School Lockers, Gym Lockers, Spa Lockers, and Warehouse Lockers, within the private and commercial sectors, all relying on the integrity of XPB Locker’s product lines. product lines and installation within the continental U.S. can also be secured through XPB Lockers. technology? We are strong advocates in protecting our planet and offer industry approved “green” recycled products when available. Complete your business plan by consulting a professional XPB Lockers Supply representative to complete your project with confidence and peace of mind. it for you. Our home office is located in New Braunfels, Texas with warehouses located throughout the United States that enable us to service all 50 states including New York NY, Los Angeles CA, Miami FL, Chicago IL, Denver Co, El Paso TX, Dallas TX, San Antonio TX, Austin TX, Houston, Texas, Boise ID, Atlanta, GA, Detroit MI, Raleigh-Durham NC, Washington DC, Albuquerque NM, Huntsville AL, Fayetteville AR, Norfolk VA, Madison WI.